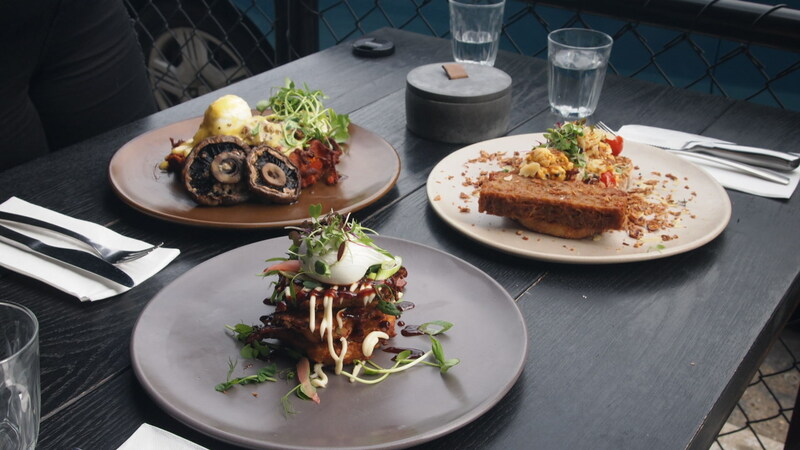 So my brunch date this week saw me making the trip across town to the very popular Penta in Elsternwick (sister cafe to Tinker Northcote, read about it here). Lured by hundreds of beautiful photos posted across my social media feeds, this is one meal that I was looking forward to all week. Before we even arrived I knew exactly what I was going to order. After seeing hundreds of pictures of their now iconic Nutella Pannacotta that had me drooling at first glance, there was no way I was going all that way without sampling it for myself. But first I had to line my stomach with a bit of veg, so I ordered the Okonomiyaki, Penta’s take on traditional Japanese fritters. Made up of cabbage, kale and carrot, the tower of three lightly fried fritters was sandwich together with kewpie mayo and hoi sin sauce, and served with some pickled ginger and an egg. To use the words of my brunch date, Happiness is Food, they were phenomenal! 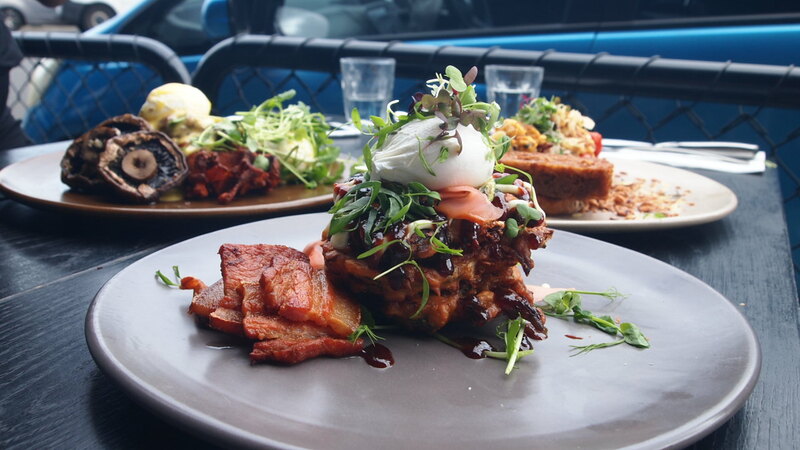 One of the better brunch dishes I’ve had in a while, they were packed full of flavour and an absolute pleasure to eat. This is the kind of dish that would have you coming back time and time again (if only it were a bit closer to home!). 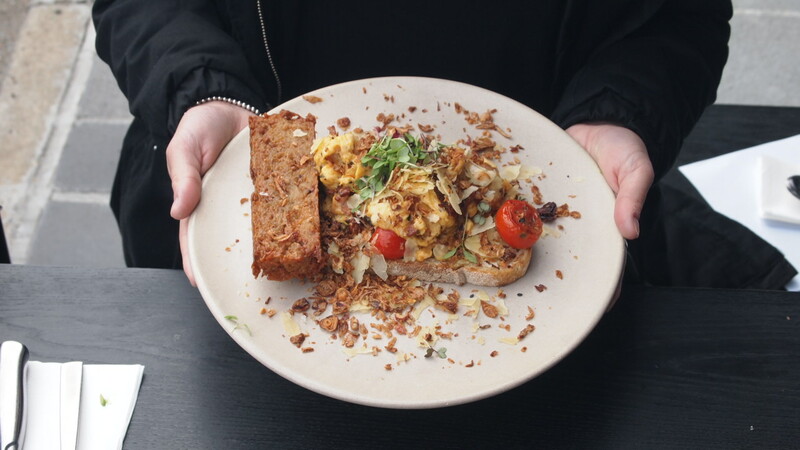 The ladies ordered the chilli scramble which as the name suggests packed a punch. Unfortunately for us, it was a little bit hotter than we would have liked and despite having heaps of potential, we struggled to eat it all. The other dish of the day was the Benedict, because you know, brunch isn’t brunch without at least one Benedict on the table. Penta’s take on the breakfast classic was awesome. 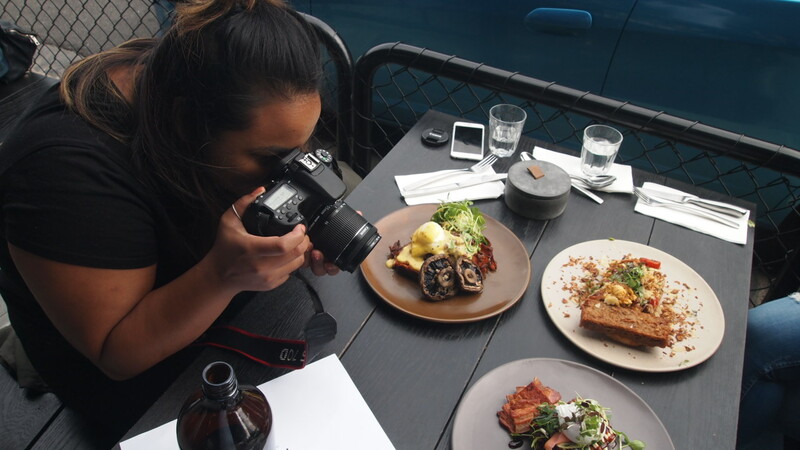 The caramelised braised beef cheek was served on top of two sweet potato waffles and covered in a jalapeno hollandaise. The flavour mix was perfect, a little bit sweet, savoury, crispy but soft, plus a kick of heat to finish it all off. 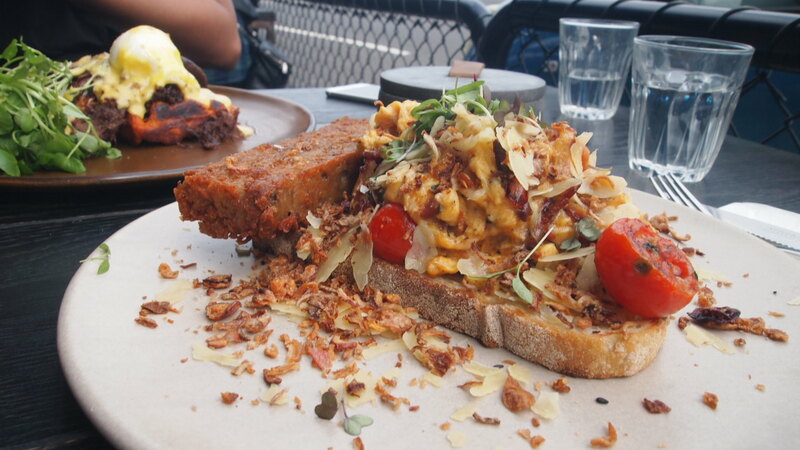 General consensus was that is one of the best Benedicts we’ve all tried, and lets just say we’ve tried a stack of them. Then came the moment we were all waiting for. 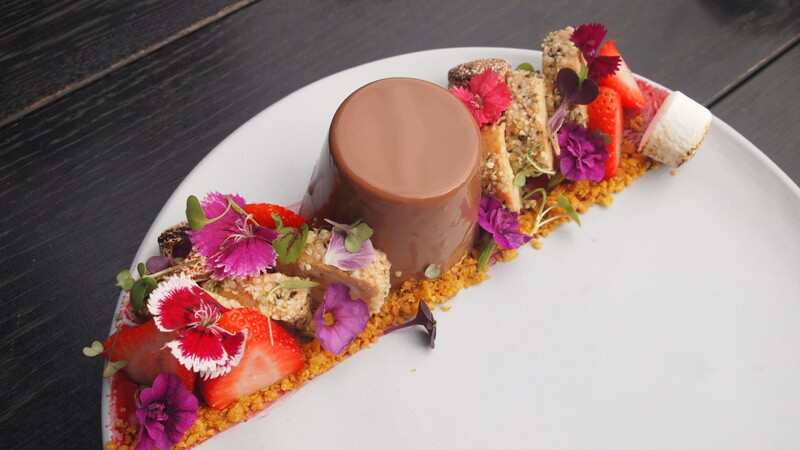 Our beautiful Nutella Pannacotta arrived. 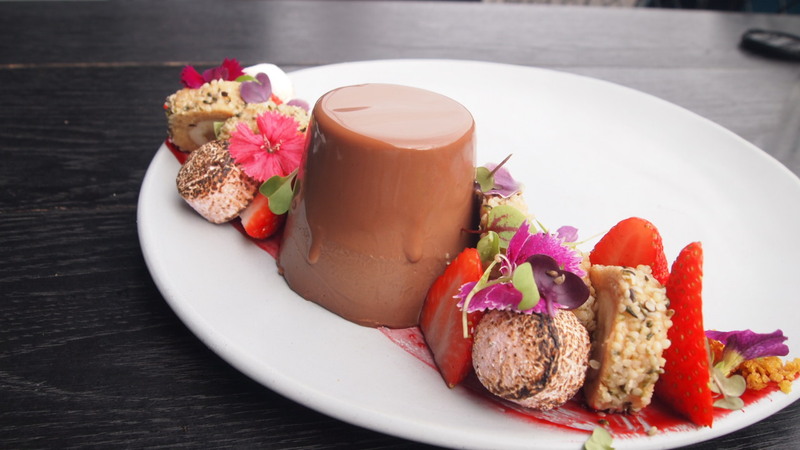 All wobbly and shiny, it was surrounded by edible flowers, strawberries, honey joy crumbs (took me back to my childhood), nut butter banana sushi (yep, it’s a thing) and a few torched marshmallows for good measure. The pannacotta itself was delicious. Rich and creamy with a full bodied flavour. They definitely didn’t hold back on the use of Nutella, which earned them brownie points with this chocolate lover. 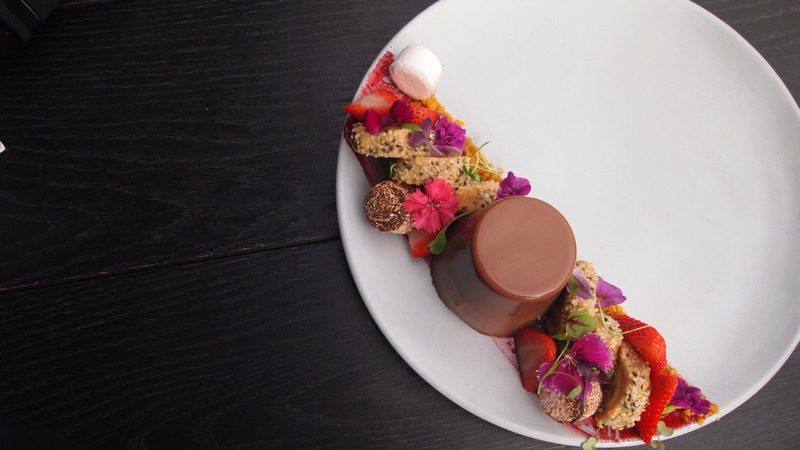 The other elements were there so we ate them, but it was all about the pannacotta for us. Located on a quiet side street, this minimalist cafe is more or less devoid of colour. It’s all about clean lines, concrete and black fittings. 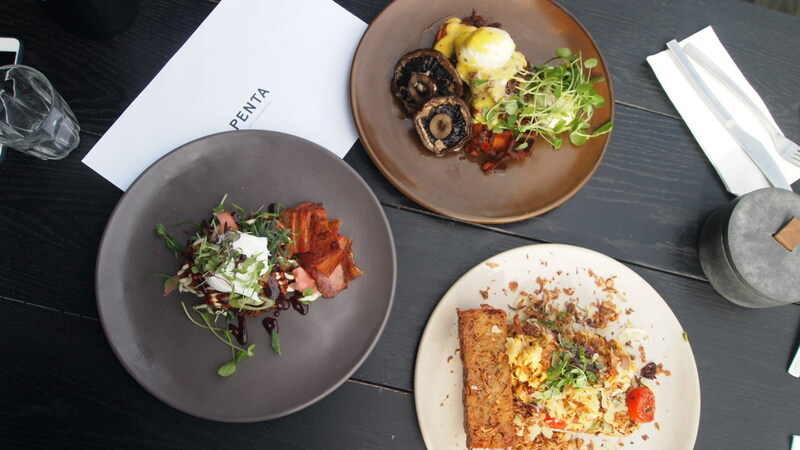 Much like its sister cafes, there is an element of class to Penta that is drawing in all the cool kids and making it the place where everyone wants to be seen. Well seen we were and conquer we did, and damn were we glad we made the trip. We dined as guests of Penta, however all expressed opinions are strictly my own.